Akita Prefecture (秋田県, Akita-ken) is a prefecture in the Tōhoku region of Japan on the island of Honshu. The capital city is Akita. Akita prefecture is famous for rice and sake. The area of Akita was created from Dewa Province and Mutsu Province. Senshu Park is 5 minutes walk from Akita Station. The site of castle of the Kubota Castle built by Satake, a daimyo from Hitachi. Landscape gardener, Abira Nagaoka, designed the park in 1896. The name "Akita" became established in Tenpyou era. Akita Prefecture faces the Sea of Japan. 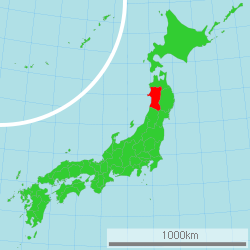 It is bordered by Aomori Prefecture in the north, Iwate Prefecture in the east, Miyagi Prefecture in the southeast, and Yamagata Prefecture in the south. Mt. Chokai is the second hightest mountain in the Tohoku Region. Shirakami-Sanchi is a large mountain range along the border between Akita and Aomori prefectures. Ōmonoimi jinja and Tsutsukowake jinja are the chief Shinto shrines (ichinomiya) in the prefecture. ↑ 2.0 2.1 Nussbaum, Louis-Frédéric. (2005). 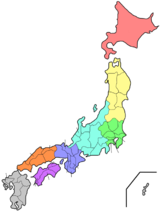 "Provinces and prefectures" in Japan Encyclopedia, p. 780; "Tōhoku" at p. 970. ↑ Nussbaum, "Akita" at p. 20. ↑ Japan Ministry of the Environment, "General overview of area figures for Natural Parks by prefecture"; retrieved 2012-9-4. ↑ Japan Ministry of the Environment, "Towada-Hachimantai National Park"; retrieved 2012-9-4. ↑ "Nationwide List of Ichinomiya," p. 2; retrieved 2012-9-4.